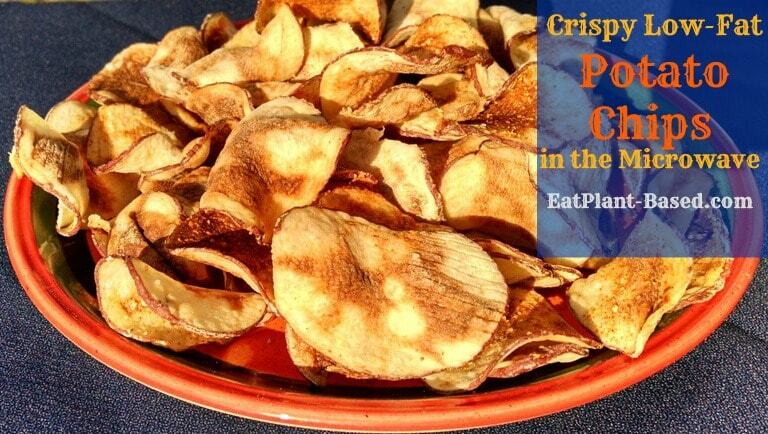 Thought you couldn’t eat potato chips on a healthy plant-based eating plan? Me too, but thankfully we were wrong! 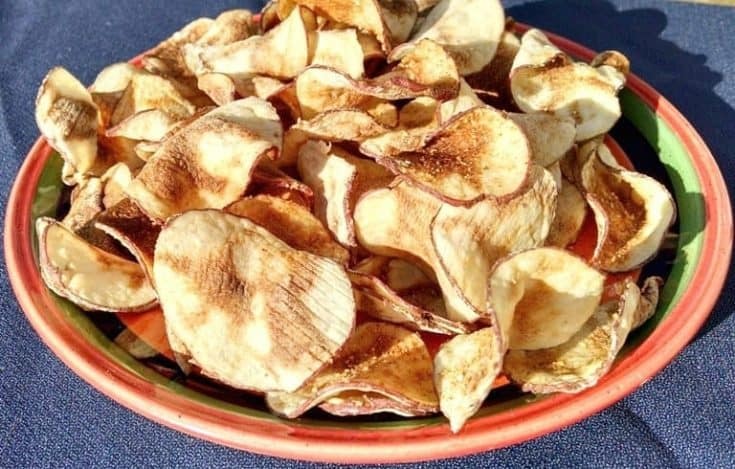 These healthy homemade potato chips are easy and delicious! I ordered this potato chip maker thinking it was too good to be true. But, I was totally surprised! I am not a sponsor of this product or affiliated with the Chip-Tastic company. It’s simply a great kitchen tool that I enjoy, however I do have an Amazon affiliate link. This little gadget makes crispy crunchy potato chips in your microwave in about 7-8 minutes. It comes with a potato slicer and recipe booklet and cost less than $15. Chip-tastic can be ordered on amazon by clicking photo. Affiliate link. 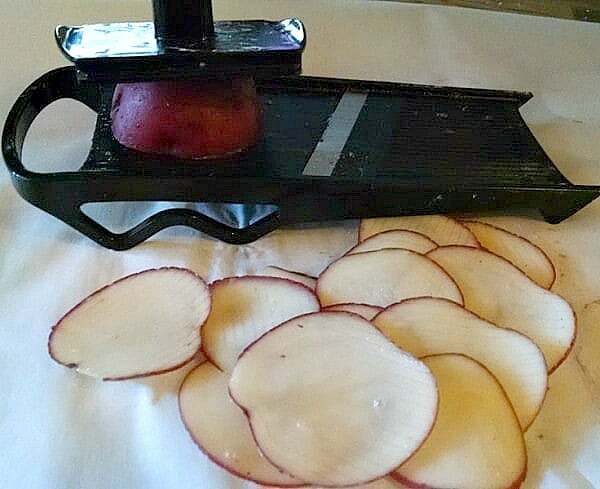 The potato chip maker comes with a mandoline for slicing potatoes. Simply slice potatoes, season, place slices in slots of chip maker, and microwave for 7-8 minutes. That’s it, and the chips are every bits as crispy as the ones from a bag. The recipe booklet offers a number of different seasonings including barbecue, dill pickle, and salt & vinegar variations. In addition to potatoes, you can also cook sweet potatoes, apples, and pears. The book also says mango, but that sounds a little weird to me. 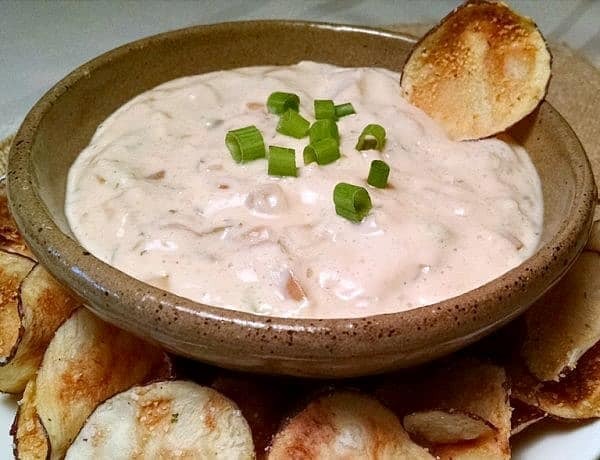 Try the chips with my French Onion Dip recipe. It’s amazingly delicious! What is so special about this recipe is that you get three great recipes in one–dip, low-fat mayonnaise, and sour cream. This French Onion Dip is delicious with crunchy low-fat chips. Fear of microwaves is not science-based. We are surrounded by devices that emit minute quantities of electromagnetic radiation. A microwave is about as dangerous as a laptop. Probably less as we don’t hold it in our lap while it operates. We should likely be more concerned about cell phone use than microwaves. Below are a number of articles from Harvard, OSHA, and World Health Organization (WHO) that might help. Potato chips CAN be healthy! This wonderful little potato chip maker comes with a potato slicer and cost less than $10. I never would have believed it, until I tried it for myself. It's true! We eat delicious, oil-free chips on our healthy diet all the time, and it only takes about 7-8 minutes in the microwave! I ordered this potato chip maker thinking it was too good to be true. But, I was totally surprised! It comes with a potato slicer, Chip-Tastic microwave ring, and recipe booklet. Simply slice the potatoes on the slicer. I scrub mine and leave the peel on for extra fiber. 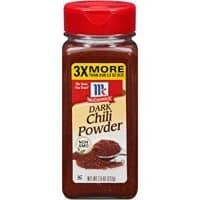 I've used both Russet and red potatoes, and they come out terrific every time. 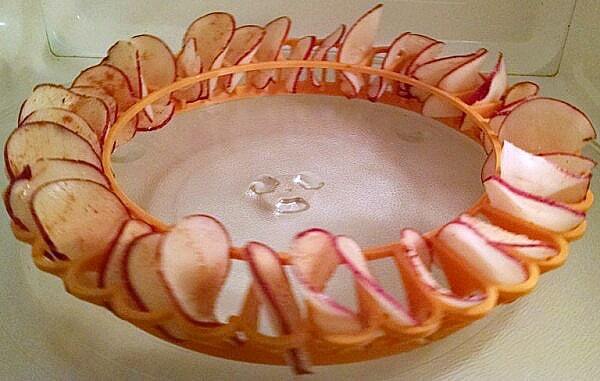 Place each slice in the Chip Tastic ring. It holds approximately 1 potato at a time (32 chips). Sprinkle with seasonings, and place in the microwave. The instruction/recipe booklet says it takes about 3-4 minutes, but I have found to get them crispy in my microwave, it takes 7-8 minutes. 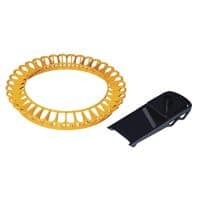 No oil needed! As unbelievable as it sounds, they come out as crispy as any bought potato chips I've ever tasted! The recipe booklet offers a number of different seasonings including barbecue, dill pickle, and salt & vinegar variations. In addition to potatoes, you can also cook sweet potatoes, apples, and pears. The book also says mango, but that sounds a little weird to me. Hope you enjoy this little gadget as much as we do! Try them with my French Onion Dip, recipe below. 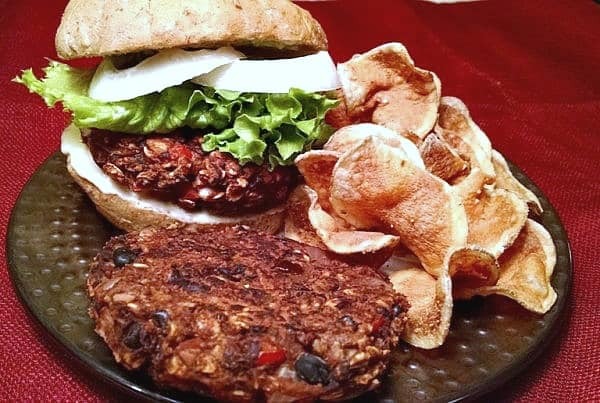 They are great with my Black Bean Burger recipe. New recipe coming up next week, so stay tuned! 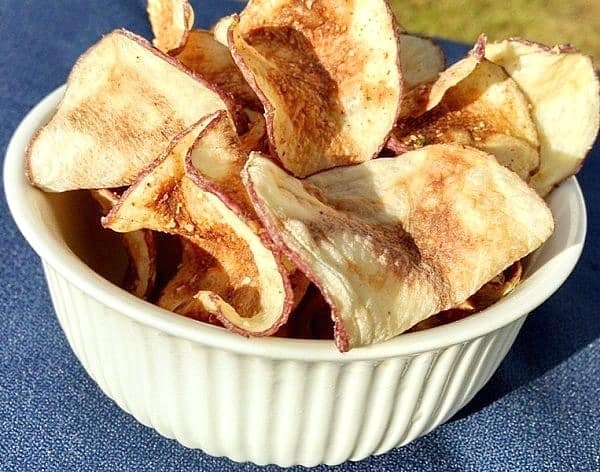 Oil-free low-fat potato chips made at home. Great post. No link to Amazon. Hi Jean, the link to amazon is at the very bottom of page. 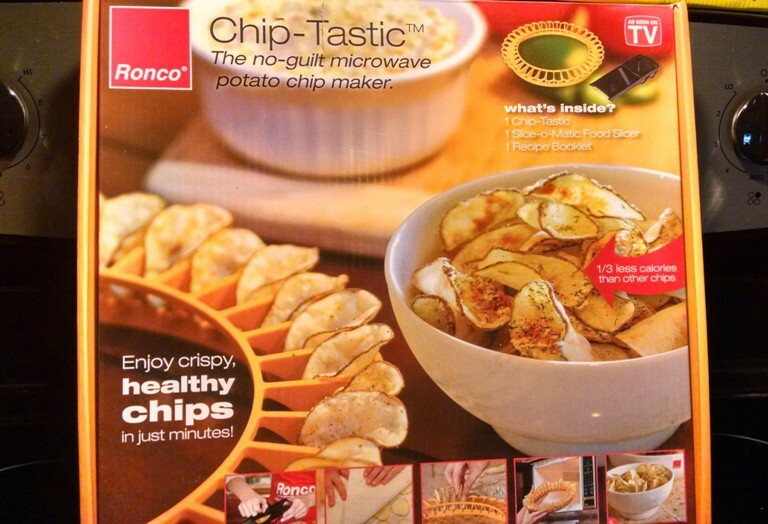 There’s a picture of the Chip-Tastic box and under it says, “Chip-Tastic is available on amazon for less than $10 and includes a potato slicer and recipe booklet. Click here for link to amazon.” Click on the picture, and it will take you straight to it. Thanks for following! Made these tonight – turned out great! Just increased cooking time as noted in recipe. Thanks! I was so thrilled this really worked! Seasoned with Penzy’s no salt Bavarian seasoning blend. The chips actually crunched! Amazing. Thanks for introducing this to me and all your wonderful healthy recipes.